 The First Lady of Song is more than deserving of a full-length biography, and English musician-critic Nicholson (Jazz: The Modern Resurgence, not reviewed) is erudite and intelligent. But this book is too often a pedestrian catalogue of dates, places, and band personnel. Perhaps the problem is, as one of his sources says, ``There's no scandal about Ella.... And that doesn't make for exciting journalism.'' 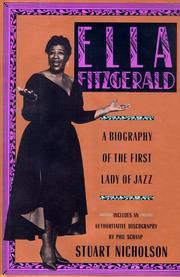 As is the case for many key figures in jazz, Ella Fitzgerald's public persona is a mÇlange of fact and fancy, legend and reality. This book, which corrects and updates a slightly earlier European edition, blows away some of the mist. Among other minor revelations Nicholson provides is the news that Ella was born out of wedlock in 1917, a year earlier than previously thought; that she had a disastrous first marriage in the mid-1930s to a smooth-talking ex-con that was annulled, and that she had affairs with several younger men during the '60s. Much more compelling is the rags-to-riches story of a young black girl, orphaned in her early teens, who rose to become one of the great artists of jazz, who has garnered countless awards, international fame, and adulation. The best passages are those that analyze Fitzgerald's unique singing style. He brings a musician's insight to these sections and even the die-hard Fitzgerald fan will learn something new from them. The book also includes an exhaustive discography by jazz historian Phil Schaap, which makes it a valuable addition to the jazz bookshelf. When he isn't writing about the music itself, Nicholson's prose lies limply on the page. But his musical analyses enliven his language, and his treatment of his subject's human and musical strengths and weaknesses is well balanced.